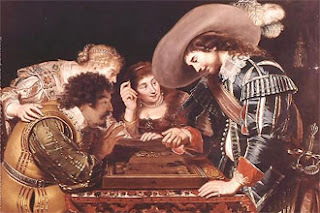 Come and play group backgammon for small stakes with a bunch of friendly backgammon fans. It's a great way to enjoy playing an intriguing board game, have a little flutter and learn about backgammon tactics and strategies from the discussion that always ensues (once a cube is turned, of course - see below). If you're new to chouettes, you may have to pick it up as you go along, though there are many places online where you can read about the rules. Here's an example - - here's another - though our rules may vary slightly.